The Research Triangle Park > STEM in the Park > STEM in the Park – My First Two Weeks! I’m a runner, and I have no clue why I thought it would be easy to start a new job the day after returning from my race weekend in Alabama. Especially since I knew we would be making the trip by 15 passenger van … a 12-hour drive (in one direction) that my husband so graciously drove for us. My team of eight other ladies and I completed a 51-mile relay race from Selma to Montgomery. Although I was exhausted, the anticipation of my first day wouldn’t allow me to sleep well the night before. Somehow, I made it to work on time that last Tuesday in March. I will never forget my first day, because I also attended my very first staff meeting as a RTF employee. I recall how exciting it was to hear about the new projects, and learn of the organization’s vision of continued collaboration and increased investment toward diversity! It felt like a perfect fit right away, and that sentiment has continued. It has also been my motivation during these VERY busy initial couple of weeks. It’s only been two weeks and I’ve already been behind the scenes, as the newest member of STEM in the Park, for two of our signature events. What a whirlwind! 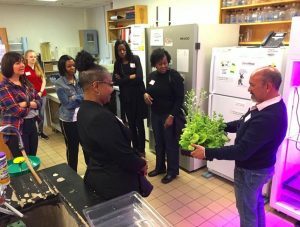 The events included our first university Educator ExternTrip, which took place at North Carolina State University. 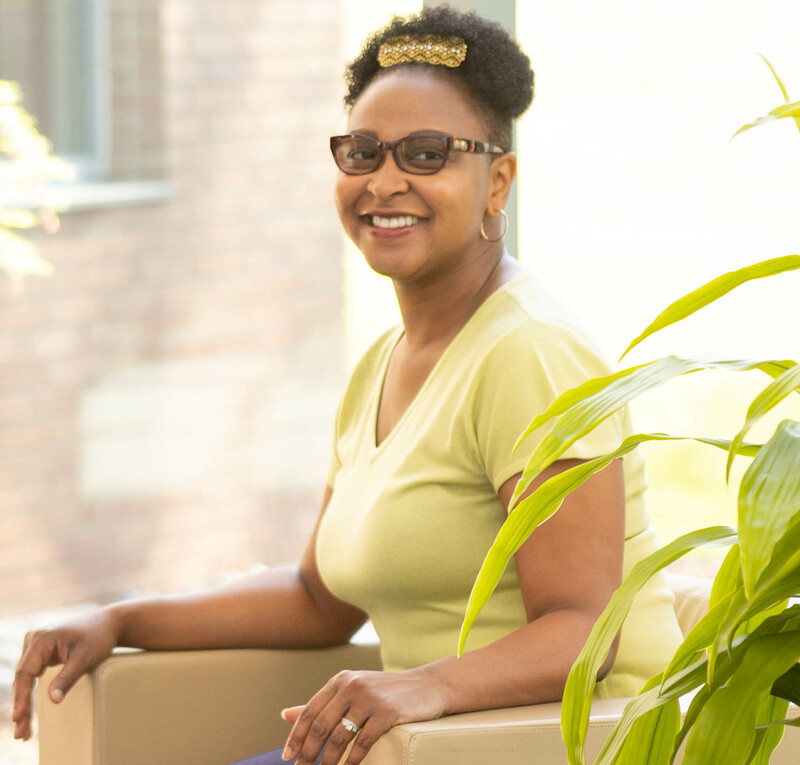 I had the opportunity to experience professional development firsthand as host J.T. Ascencio-Ibanez, Ph.D., assisted fellow educators in creating lesson plans they could use to make STEM relevant to their students. It was touching to hear Dr. Ascencio-Ibanez explain how his passion for biochemistry is driven by a desire to solve problems that are useful to the world—including personal ones, like figuring out how viruses were being spread via tomatoes can affect salsa (which he loves). It was also moving to see the enthusiasm of the educators as the host provided us a tour of his lab, providing examples of how less expensive science projects could be conducted in their classrooms along the way. The second event was SciFest, where I played the role of speed mentor and MEET facilitator. Helping to plan an event for more than 130 middle and high school students can be quite daunting as a new employee, but interacting with those students made it all worth it! When asked, “What did you learn today?” one of the students replied that STEM in the Park helped them realize that there are more pathways and options for STEM careers than they ever thought. “I am glad I had the chance to meet such smart students who could become future employees at our company,” shared one mentor. My director and our two AmeriCorps VISTAs are zealous about what we do, and the atmosphere of innovation in the Frontier RTP 800 building is both inspiring and contagious. 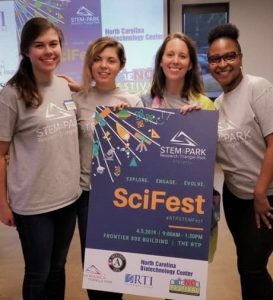 Being a part of these events reinforced my passion for the work ahead of me as the new Program Manager of STEM in the Park: exposing under-served youth, and their teachers, to STEM and STEM careers. That, and the fact that I work with an amazing team in one of the coolest areas of RTP feeds into my intention to make an impact in my community and live life to the fullest. I’m looking forward to the next event already!